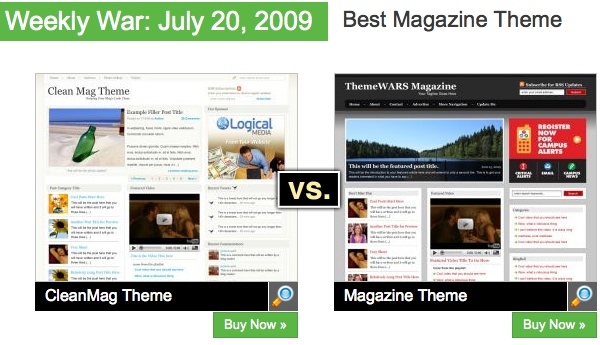 Here’s a cool idea — let WordPress themes battle each other. Allow me to explain… a new website from the guys at Unique Blog Designs lets designers compete for the best theme. Theme Wars allows users to vote on which one they like the best and the winning theme gets placed in the store for purchase. The winning designers will receive 25% and 10% of the purchase price each time their theme sells. This is not only a great opportunity for designers, but for bloggers as well. A monthly membership is offered that gives you access to all of the themes. If you’re only after one particular style, the price is $69 per theme, or $149 for a developer license, which includes Photoshop files. There’s a new set of themes to vote on every week, so it definitely won’t get boring.